highest recorded temperature: 44.9 degrees. precipitation: 781 mm average annual. Maputo has a humid subtropical climates and the weather varies according to the two climatic seasons of the region: summer and winter. The most relevant aspect about Maputo climate is the accentuated annual variability in precipitation. The period between October and April presents rainy and hot weather (summer) while the months from May to September are cold and dry (winter). The average annual precipitation is around 800 mm, the maximum average monthly rainfall occurs in January (125.8 mm) and the minimum (13.1 mm) occurs in August. During summer the average temperature value is around 30-31°C and precipitation during the months of November to March represents 73% of the average rainfall. In the winter season the average temperature is about 25-26°C during the months of July and August, with scarce precipitation (average values do not exceed 20mm between May and September). Southwest winds prevail in the summer while Northwest winds are predominant during the winter. In southern coastal zones of Mozambique, storms occur in the form of meteorological events characterized by intense wind and precipitation, usually associated with the passage of tropical cyclones, typically category 4. Climatic characteristics, as well as other biophysical features, intensify the occurrence of other extreme events, such as floods and cyclones. The average monthly temperature is quite stable with an average annual rate of about 23˚C. The average maximum temperature varies from 25°C in the months of July and August to 30°C in January. The minimum temperature varies from 14°C in July-August to 20°C in January. The annual average relative humidity is 66.6%, with slight oscillations during the year. March has the highest values for relative humidity (71%), while lower levels are registered in June with 63.5% of average relative humidity. 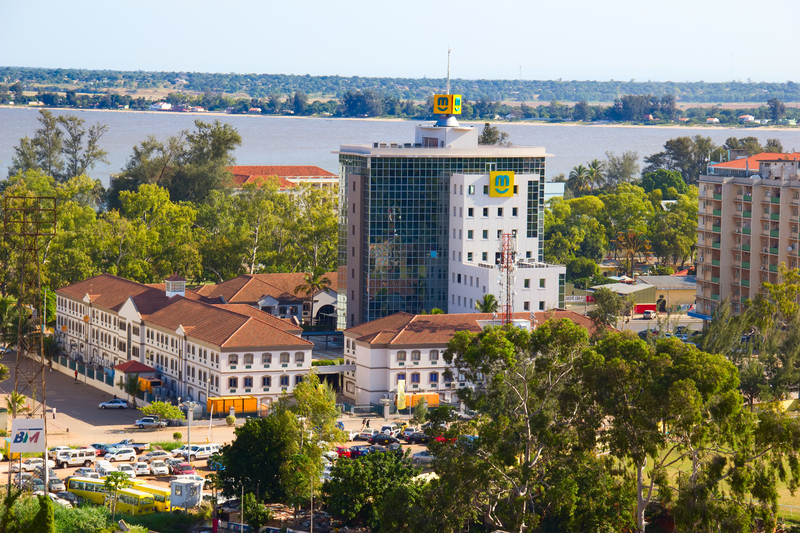 The municipality of Maputo is composed by non-contiguous areas around the bay of Maputo: the Municipality Centre, KaTembe and the islands (Inhaca Island, Portuguese Island and Xefina Grande Island). The total area corresponds to about 308Km2. The Municipality Centre is the largest one with about 167Km2 that represents 54% of the territory, followed by KaTembe with 94 Km2 (31%) and Inhaca with 47 Km2 (15%). According to PEUMM Regulation, the space allocated to the Ecological System in the Municipality of Maputo is constituted by a set of green areas, as far as possible continuous or interconnected and integrated with the urban space to secure the biological systems functions, regulate atmospheric flows, water runoff from rainfall and the bichromatic confort. These areas also contribute to the quality of urban space offering suitable places for recreation and leisure. Área de Conservação Transfronteira dos Libombos (Libombos Transboundary Conservation Area). The rapid transformation of the territory of Maputo Municipality, verified in the last decades, presents a difficult challenge to spatial planning, component of management, or within the scope of sustainable physical planning of this city. The Municipality of Maputo, whose area is 308 km2, has an urbanized area of ​​about 110 Km2 (excluding the areas as forest, indicated in the current land use plan). Of these areas around 90 km2 have dominant residential use, where live and work approximately 1,150,000 people, according to preliminary data from the Population Census of 2007. The set of developed urban areas, has on average a population density of 70 inhabitants per hectare. About 14% of the population live in urban space, concentrated essentially in the Municipal District Nº1. In developed urban areas, (8,400 ha) characterized by single-family residential typology with lack of infrastructure, there are extensive areas to be planned, that is, areas that lack of legal certainty of use, demarcation and registration in the municipal register; a situation that makes it difficult for users to access services such as water and energy distribution networks, rainwater runoff. 40% of the urbanizable spaces is occupied by areas that, despite the lack of infrastructure, have formally demarcated plots. A widespread indiscipline in the control of their occupation causes densification as a result of the construction of more than one single-family house per plot. The land considered as Developed Urban Areas (Urbano) and Developable Areas (Urbanizável) correspond respectively to the consolidated areas of the Municipality (800 ha) and to areas still susceptible to densification (8000 ha). The predominant use is residential that represents 30% of the activities. This computation includes the areas occupied by highways and railways. Industrial activities, storage facilities and workshops occupy 456 hectares. Land consumed by agricultural practices, still one of the main livelihood activities for a considerable part of the population, occupies 25% of the municipal territory. Ecological System zones occupy a third of the municipal land, with emphasis on areas in Inhaca and Catembe. This classification includes wet and flood-prone areas (3,858 ha), wetland areas with 758.03 ha, water bodies with 91.2 ha, areas of natural vegetation (shrublands), predominantly mainly in Catembe and Inhaca, with 5,132 ha. Parks and gardens extend over 257ha, of which 525ha are of protective greenways. Areas destined for public services and facilities, including community services (health, educational, cultural, sports, religious services, etc) and special activities (airport, cemeteries, landfills, military fields, etc. ), cover about 2510Ha, 1582 of which are for special activities. Residential areas represent approximately a third of the total land use activities in Maputo. Large tracts of land are devoted to single-family dwellings settled in unplanned urban environments driven by an extensive urban sprawl that lacks basic infrastructure and public services.